Miami is a place where I’d expected to see pristine white Art-Deco architecture and bright blocks of colour against a backdrop of picture-perfect blue sky. I was looking forward to hard shadows thrown across streets dotted with finely-tuned bodies in beachwear. But last year when I was there, Miami was grey, overcast, and soaked by a constant drizzle of rain. No problem, I thought, I shoot in black and white anyway. And then something strange happened. Despite the streets being saturated with water but lacking the same intensity of colour, I captured a moment that could not have worked without it. The rain was coming down so hard at this point I’d taken shelter under an awning. While I waited I took in the street and pointed my camera at passers by. Iconic yellow cabs cruised back and forth. Pedestrians made a run for it, others joined me under cover. Shop keepers looked forlorn as cars passed, packed with tourists not willing to stop. People exchanged grimaces and rolled eyes that said this was not what we expected. 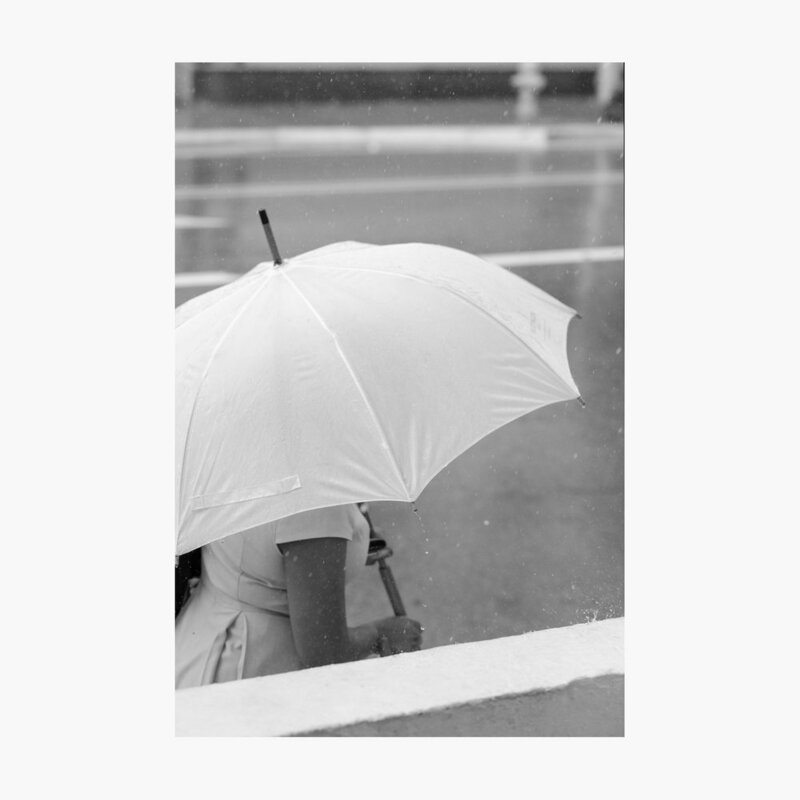 I caught sight of a woman striding along the street: Cornflower blue dress and a pristine white umbrella. I trained my lens on her and clicked away as she passed. When I later looked at the modern equivalent of a contact sheet I discovered a number of attractive although ultimately disposable shots. But nestled between them was a special one. The woman in cornflower blue is partly obscured beneath her white canopy, rich tan skin complimented by the oak trim of her umbrella and a burnt orange purse. The air is studded with sparkling flecks of water. A great sweeping arrow, white on grey tarmac, points from the woman to a passing yellow cab that’s ready to whisk her away from the rain. Deceptively simple at first glance, but the narrative is there when you linger. It’s a touch of storytelling that I’m always striving for, a series of separate elements coming together to form a greater whole. It’s often the way with moments like these that something is off; a detail not quite where you want it or one aspect missing that would otherwise paint the full picture. Not this time. The photographs in sequence demonstrate just how fleeting this moment was: Over in a beat, a blink of an eye, a click of the shutter. I processed the image in black and white, as a test. But it falls flat, the layers and storytelling lost in a fog of grey. Colour doesn’t have to pack a punch, but even when subtle it can guide the eye through an image, separate layers, and reveal elements in sequence. No doubt the yellow cab is the most prominent hue here, but there’s subtleties at work too: The warm yellowish-whites of the road markings—ambient colour reflected from that taxi cab—contrast against the cool blueish-whites of the umbrella. They provide a subtle separation of foreground and background; tones washing through the image from warm to cool, top to bottom. I shoot almost exclusively in monochrome, so it’s ironic that one of my favourite shots from a six-month trip across North America should only work in colour. And despite my grumblings—and the mild disappointment at not seeing Miami in those glorious sun-drenched hues—it’s one that would never have come together without that wet and dreary weather. For more on this topic, take a look at my first article; A Note on Colour. You can also view my triptych mini series from South America; Peruvian Colour Studies.